We've been involved with Willowgrove since 2010. 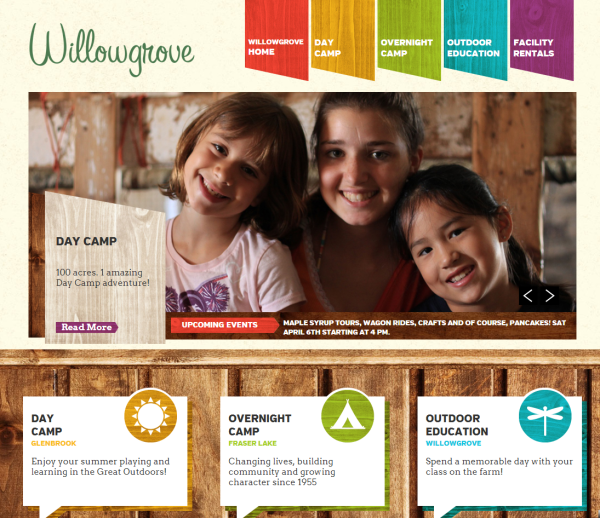 When we started with Willowgrove, their 3 websites were out of date, and developed in a manual fashion that made them difficult and expensive to update or optimize for Search Engines. While getting to know the staff, we quickly realized that Willowgrove has many talented individuals on staff, both experts in their fields, as well as professional videographers and excellent content developers. We knew we had to come up with a way to let them shine. 1) Immediately migrate the existing sites to a content management system. This would allow them to bring their videos and content into play, as well as allow the web site to be optimized for Search Engines. 3) Train their team in the maintenance of the site. Next, we would work the their team to consolidate their 3 distinct brands under a single "Willowgrove" umbrella, and cross promote program features and events. 4) Extend the power of their website to automate camp dates, collection and processing a large number of job applicants. In February 2013, we rolled out the newly branded Willowgrove site, consolidating the distinct "Glenbrook Day Camp", and "Fraser Lake Camp" brands. We worked with Willowgrove's graphic artists and videographers to create a website that allows Willowgrove staff to easily update content, feature new events, share photo's and embed video. Using reports from Google Analytics, we can show the that traffic to the site has more than doubled for the month of March (2013 compared to 2012). Importantly, visitors are learning more about each program that Willowgrove offers, as measured by visitors spending longer on the site, and viewing more pages per visit. Google has noticed the work too, and now places Willowgrove on the first page in many local camping and outdoor education searches.